When Sociology 1A came in as the top active list for semester one we asked list owner Susie Donnelly, co-convenor of the course, for some feedback. In addition to her own experience using Resource Lists @ Edinburgh, Susie also asked her fellow co-convenor, the tutorial representatives, and the students (via the course Facebook group). Great e-resource for the readings. Resource list – organised and easy to use. The resources on Learn are brilliant. Resource List was a great tool, everything was so accessible to students. It’s great that everything is so accessible. While it is important that students still learn how to use the library, a resource list like this makes things a lot less stressful, particularly as a lot of the books that contain the readings will be in high demand and there may not be a lot of copies. I particularly like being able to download the readings as PDFs so that I can highlight and make notes on them on my laptop … I think that more courses should adopt a resource list like this. – Emma McFarlane, Sociology 1A student. This entry was posted in Library, Online library resources, Research & Learning Services and tagged Resource Lists @ Edinburgh, students, User Feedback on January 29, 2015 by Stephanie Farley - Library Learning Services. Averaging 67.3 visits per student, Sociology 1A took the top spot for most active Resource List in semester one 2014/15. I spent less time this semester dealing with issues to do with access to readings. Particularly helpful for first year students who are getting to grips with university life. Students have reported that they are very happy with this tool. The Resource List has certainly made life a lot easier. Sociology 1A is an extremely large course, with approx. 480 students and the numbers are growing each year. This places a significant demand on us to provide the required material for students in an accessible, reliable and responsive way. The Resource List has helped in this regard and once the list was up and running, I believe I spent less time this semester dealing with issues to do with access to readings. While the initial set-up took some investment of time and energy, I was supported with training and support from staff in the Library Learning Services. In the Resource List, students are shown multiple ways to access readings and the interface is very straightforward – this is particularly helpful for first year students who are getting to grips with university life. As the semester progressed I was able to add new and up-to-date resources and material (rather than being limited by what has been published in the course handbook at the start of the semester). In particular, around the assessment period I was able to respond to requests from students for more academic writing support. However, I should also mention that the use of these kinds of tools raises questions about independent learning and the extent to which library and research skills are being displaced. For the moment though, the students have reported that they are very happy with this tool…and if the students are happy then I am happy! This entry was posted in Library, Research & Learning Services and tagged promoting lists, Resource Lists @ Edinburgh, User Feedback on January 26, 2015 by Stephanie Farley - Library Learning Services. We hope everyone is feeling rested and refreshed after the winter break and ready to take on the new semester. In at Library Learning Services we’ve been working hard to ensure all submitted lists were ready for semester two. If we created a list for your class please make sure to read through the information provided in your email and then publish your list. Don’t forget to promote your list to students! Your resource lists can also be promoted to students in these spaces. 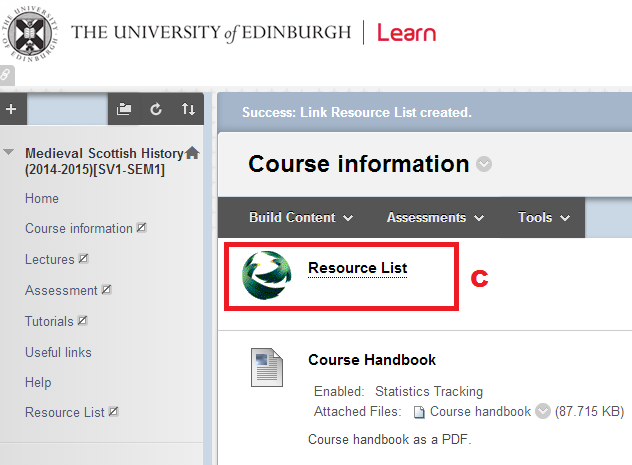 Information on adding the resource list tool to a Learn course is available on the IS Learn Tools website. This entry was posted in Library on January 12, 2015 by Stephanie Farley - Library Learning Services.